Last weekend I was in the mood to bake again - it was convenient that I could bring treats to work for a co-worker's birthday on Monday. I pulled out the Eagle Brand Classic Recipes book and looked through to see what sounded good. Lemon ALWAYS sounds good. 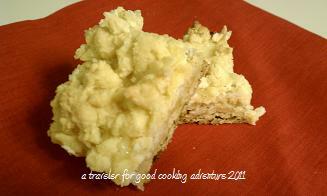 This is an easy recipe, the filling is very similar to what I use when making key lime pie. The use of saltine crackers was a surprise, but it added a little salty crunch that was pretty tasty. A friend told me she liked them because they weren't too lemony. Personally, I might make them more lemony next time...or even lime. The recipe called for a 10x15 jelly roll pan. I used a foil lined 13x9 pan instead for a little thicker bar. Preheat the oven to 350. Grease pan. In a large bowl combine cake mix, butter and egg, mix well (will be crumbly). Stir in cracker crumbs. Reserve 2 cups crumb mixture. Press remaining mixture firmly in bottom of pan. Bake 15 minutes. In medium bowl combine the egg yolks, milk and lemon juice. Mix well. Spread evenly over crust. Top with remaining crumbs. Bake 20 minutes or until firm. Cool, cut into bars and store in the fridge. As always, I cut things into pretty small pieces so that people feel less guilty about trying a treat. Give them something too big and they'll say "oh no, I can't". Instead it becomes "they're tiny, have two!"